It seems like there is an RV show about every weekend this time of year. How do you know which one you should attend? The following are five things you should look for when deciding what RV show to attend this season. 1. First off, is it really an RV show? Some events billed as an “RV show” are really just a parking lot sale put on by a single RV dealership. While they may list lots of different brands in the advertising, be aware that not all the brands listed may be new RVs they are licensed to sell by the manufacturer. Many times dealers may mislead the public by also listing the used brands of RVs they are selling at their “RV show”. At one dealer “shows” you won’t find the large selection of new RVs that you would at a real RV show with multiple dealers. Most of all, there is no competition between dealers assuring you are getting a fair price. 2. Is the show produced by a private promoter or an association comprised of local RV dealers? Private promoters are in the RV show business primarily for the money. The money they collect from you at the gate and the money they collect from the dealers to exhibit. If they aren’t making a profit producing RV shows they will either produce another event in the venue or move on to a different city where they can. 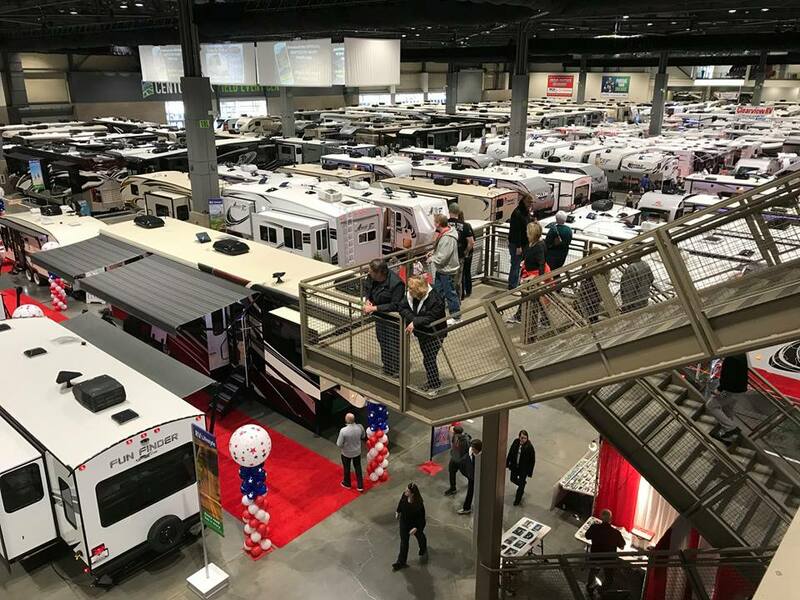 On the other hand, RV shows produced by a dealer-owned association are there to showcase the RV industry, lifestyle and all it has to offer with the goal of providing show attendees an educational and positive experience and if they are lucky, cover their show costs while doing so. In other words, dealer-owned shows typically provide more bang for less money. Going to shows with the most dealers equates to more manufacturers, more brands, and a larger selection of each brand. Go to the show’s website and determine how many dealers will be exhibiting. Just like you have to decide which RV show to attend, so do factory representatives. Once again, larger shows with more dealers are much more likely to attract factory representatives for the brands you are interested in. Factory representatives are a great information resource as they typically know the models and manufacturing process much better than the dealership’s salespeople. What else does the show offer besides hundreds of shiny new RVs? Look for shows that also feature educational seminars and exhibits as well as opportunities to learn more about RVs and places to explore. Hopefully, these tips will help you find the right RV show leading you to many future adventures in RVing! Just finished attending the RV show at the Chantilly Va Expo Center. Many manufacturers, many dealers, and many booths seemingly unrelated to camping. Was only $8 with the Good Sam card. A great opportunity to compare many models in one place. When we left, we were very satisfied with the purchase we made 6 months ago. There was nothing at that entire show that I would rather own. Last rv show I went to was probably my last. The wife and I looked at and in everything from the small teardrops to the 500k class a pushers. While all of the sales people were friendly, one of the first questions asked by each was about our rv experience. When we replied that we had owned an Airstream for 10+ years each quickly lost intrest in us. As we continued touring trailers and coaches we both began noticing the cheap materials and shoddy workmanship in a wide range of units. The class a units were all set up along the rear of the coliseum so that they were the last units to be toured. The crown jewel of the class a units was a massive unit with a price tag north of 400k. The dealer had set two salesmen up at the unit, one outside and one sitting in the front seat area of the motor home. The unit was beautiful with leather and granite everywhere. Passing through the galley to the bedroom the wife noticed a corner trim piece that was loose and hanging, the inside salesman immediately exclaimed “too many little hands” referring to the children that had attended the show (when we attended the show had been open about three hours). I don’t know about most but our children/grandchildren are very much a part of many of our camping adventures. I would be livid to buy a 400k unit only to find a 5 year old can rip it apart in short order. We have now owned our 45 year old Airstream for 18 years and have yet to find another unit we would replace her with, including newer Airstreams. Just attended the RV Adventure Show in Denver, CO (Jan. 9-12). Attended every seminar/lecture we could, and learned a lot! Also enjoyed talking the the manufacture reps for our travel trailer, and the sales folk from the dealership where we bought our rig. We purchased our Outdoors RV Creekside travel trailer this past June, and are interested in after market improvements and other products related to the RV experience. We were disappointed that there was practically NOTHING of that nature at this show. What a missed opportunity! Just Wondering? Was the Top photo from the Cleveland RV show? Those stairs look like the stairs that lead to the Giant Ferris Wheel that goes through the roof of the IX Center. As far as some comments here. I guess your experience at RV shows (like everything else) , can vary. I Never had a Dealer “Give Me the Brush Off”, due to the Fact that I owned my Motorhome for more than 10 Years. Most of the Dealers I visit at the show, are dealers I have done business with previously. Parts, service, quotes. The only thing I look for other than my Favorite Dealers is New Technology for RV’s and information about RV Parks. I Will Never Understand Why Anyone Would Ever Pay To See Commercial Products Being Sold. They Be RV, Car, Tractor Shows, Those Businesses & Corporations Selling At These Events Pay To Be There To Show & Sell Their Products & Make $$$$, Period. When These Shows Started Decades Ago Their Was Never A Entrance Fee, Ever. I Am Always Amazed How People Today Are So Hoodwinked. Just Think, How Many Businesses Would Stay Open For One Day If Customers Were Charged Each Time They Went In To See Products & Buy Goods? It Is The Same At So Many Flee Markets In The Country To Think They Can Charge An Entrance Fee. Vendors Selling At Flee Markets Pay A Fee To Set Up & Sell. Case Closed! Most of the rv shows in my area are in the winter, so it’s just nice to get out of the house for a couple hours after being inside all winter avoiding the cold, as far as the entrance fee it isn’t anymore than a movie, I just enjoyed looking i’m not in the market to buy and really don’t want to talk to the salesman just want to be left alone to walk through everything. Alicia I hear ya on getting out and about. Still to pay the price of anything to see commercial sales show of RV’s is no different than if one is charged to go to the grocery store or any retail outlet. I will just not do it. Take Care. I understand every comment I’ve read so far, and what Mr. Porter says makes a lot of sense. That said, I don’t think we should have to pay but I’m kind of glad we do or the places would be like a free amusement park for anyone looking for free entertainment. Paying indicates an interest of some sort, even if just to see what the buzz is all about. Personally me and my family have the dubious distinction of being serial RV purchasers and are on our 5th in 1o years. Slow learning curve and some upgrading. We enjoy going for the pure entertainment value, to dream build and to look at innovation and design enhancements too. I think I might even be willing to pay VIP pricing to get in a day earlier than everyone else. I think the obvious advantage of shows is centralization of dealerships. Since most dealerships close at 5 or 6 it’s difficult to see units and you end up driving all over on Saturday mornings. Also, you can run back and forth between a few units to narrow the choice down easier than trying to remember what the one you saw 4 weeks ago was like compared to one you’re seeing today. We refuse to go to any of those RV shows anymore. The one near us comes around once a year. It costs $15 a person to get in, so $30. For the two of us, plus parking, at about $15. That is crazy! We have an RV, and don’t plan on buying a new one anytime soon. We like to look, and want to see all the RV products that we might need. We love going to Quartzite, Arizona. Lots of good things there.